Storytelling maps have recently become increasingly popular, as they provide access to otherwise inaccessible places or services. A printed map is a tangible object which mediates the storytelling process. 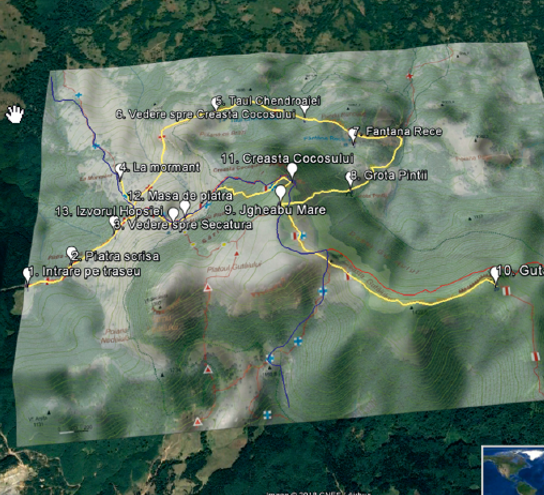 This particular map, featuring the adventures of Pintea Viteazul (Pintea the Brave), a Romanian folk-hero, is designed to enhance tourist experiences during outdoor activities in a mountain area with relatively accessible infrastructure and scenic features: the Mara Valley and Creasta Cocosului (Maramureş, Romania). The main research questions revolved around the experience design. The research was based on designing and testing a specific storytelling map for mountain tourism. The main stages of development were the experience design and the map itself. Focusing on a complex geographic location famous for its volcanic relief and folk tales, it tells the story of the mountain by tracing a parallel between geological features and a national legend.